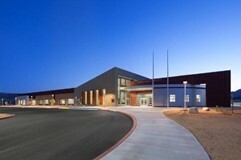 Joshua Tree Elementary is located in the central area of Joshua Tree, about three blocks north of Highway 62. During the 2008-09 school year, 367 students in grades K-6 were enrolled. The demographic composition of student enrollment includes 20% receiving special education services, 7.1% qualifying for English learner support, and 93.6% enrolled in the Free and Reduced Price Meal program. Joshua Tree Elementary is the only school in the district to house a federally-funded preschool program (half-day) for children ages 3-5 who are severely handicapped. All school staff are committed to celebrating the uniqueness of each child and guiding each child to fulfillment of his or her potential. A rigorous, challenging curriculum, creative intervention programs, and schoolwide incentives continue to foster academic achievement and increase student performance levels in both reading and math. Joshua Tree Elementary where learning for the future takes place.